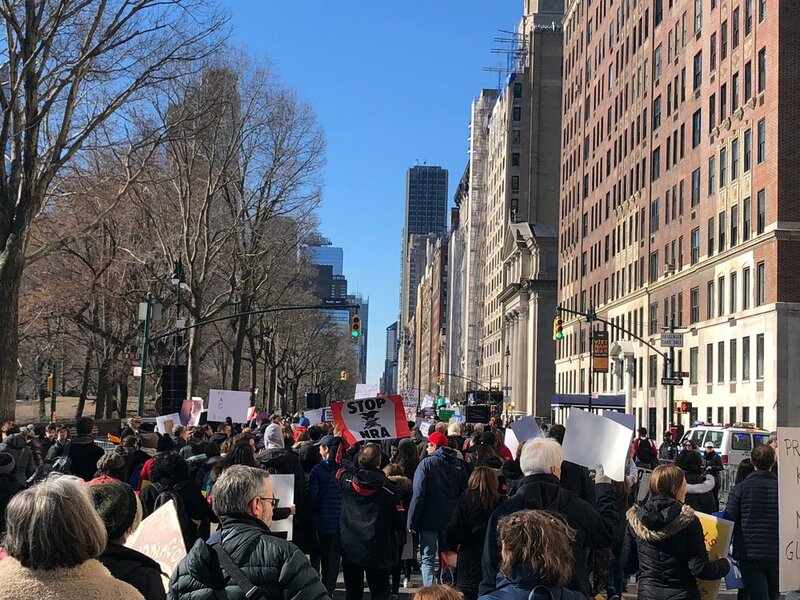 On Saturday Kim & I joined the thousands of Americans who took to the streets to support the #NeverAgain / March for Our Lives movement in LA & NYC. I marched not only to show my support for the survivors of the Parkland shooting but also for the survivors of all the countless mass shootings we’ve seen in this country - from elementary, high schools and universities to movie theaters and concert venues to the streets of our neighborhoods. I also marched for something bigger than a single issue… I marched to show the young people who are the center of this movement that their voice matters. I think we are finally learning a new lesson in this post-Parkland era … when young people show up, speak out and most importantly VOTE, people listen and laws change. My generation has grown up with school shootings. I was in 6th grade when the shooting at Columbine happened. This shaped me in a way that I wasn’t aware of at the time. I look back constantly and think, “Wow, 6th grade. We were too young to see such real-life violence in a place that should be safe and trustworthy.” I was hundreds of miles away, thinking of the kids, just like me, who were in the school; thinking of the kids who watched their friends die that day. Thirteen years later, when the shooting at Sandy Hook Elementary occurred, I was finishing my Master’s Degree and about to embark on an internship at the United Nations in the Office of Disarmament Affairs, where I would work on issues involving the global small arms and light weapons trade -- the gun control debate at a global level. I still get sick to my stomach thinking about the kids at that school and the nightmare their parents lived, and continue to live for those who lost their children so young. I tried, like most things, to see the positive - maybe NOW we will act. How could we not? These kids were five and six years old, how can we sit back? As a country maybe NOW we’ve seen enough. Of course, like every other school shooting to date, nothing overwhelming or dramatic happened to the regulation of gun sales in the U.S. I was disappointed but didn’t give up, especially after being a witness to the signing of the Arms Trade Treaty in the spring. In the weeks after the Parkland shooting, we saw Florida lawmakers start to make moves towards major changes to their gun laws. Now, who knows if these changes will happen or if they will be sweeping or impactful, but the point is lawmakers are listening to their constituents. This is an election year. People have a lot of power in election years. It is our time to make sure our voices are heard. Marching, protesting, posting on social media, speaking your mind, writing blogs like this... these are all well and good, but the way we will make true change on any issue of your choosing is by showing up on election day. Vote for the people you think represent your views and issues, and who you believe will do their best to echo your voice in your home city, your state capital and Washington D.C.
At Saturday’s March, I was moved like never before. I found myself tearing up behind my sunglasses as I walked down Central Park West with my friend, a former teacher himself, discussing with him the importance of this movement, the bravery of these teenagers, seeing the signs people were carrying, and hearing the reasons they were out to march. People have been shaken awake and are ready and willing to fight for change in a way I haven’t seen. The students from Parkland have moved people to the point of action and it amazes me. If I had endured that kind of trauma at 15,16, or 17 years old I don’t know that I would be out of bed, let alone lead a revolution. These students are brave, strong, passionate, and dedicated to making a change.They are a reflection of what each of us should be in order to make our country great again. They embody the pillars on which our country stands and I cannot wait to see what comes from their strength. You may be reading this thinking “this sure isn’t non-partisan like your organization advertises that it is.” To this I say … school safety/public safety shouldn’t be a partisan issue. Is that an ignorant thing to say? Sure. Maybe it is. I have worked with legislators on both sides of the aisle. I’ve lived in the most conservative of towns and the most liberal of cities and let me tell you: if there is one thing everyone one wants, it’s the safety of their children! Across party lines, there are certainly differences of opinions on how to ensure the safety of our children, our teachers, our neighbors, our families, our friends; I get that, and that is the partisan issue. We’re the People advocates that no matter what side of the sacred “aisle” your political views live on, you get out and you vote to ensure your voice is heard by the elected officials who represent you. “Decisions are made by those who show up.” Aaron Sorkin, thanks for writing this for your characters to say in The West Wing. It is the truest statement about voting I’ve ever heard. Please, keep that in mind when you think about the many issues that face our country today. “Decisions are made by those who show up.” Maybe gun violence isn’t “your” issue. Maybe women’s reproductive rights are. Maybe education for your children is what drives you to the polls. Is it taxes? Healthcare? The economy? Immigration? Whatever “your” issue is or hopefully whatever range of issues you care deeply about please make sure you show up in November and vote for the people you believe will show up and make the decisions you want to see made. “Decisions are made by those who show up.” Will you? See you at the polls friends!